When Yoda's clones turn on him and he must make a quick escape from Kashyyyk, Chewbacca and Tarfful lead him to a pile of bushes that are hiding an escape pod. Luckily for Yoda, it seems to be an escape pod that Wookiees use if they ever need to ship their shins off of the planet in a hurry. Conveniently, Yoda is only about the size of a Wookiee's shins, so the pod is a perfect fit! What luck, Master Yoda. What luck! 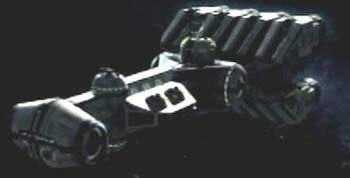 It is made clear in the movie that the ship Bail Organa takes Yoda and Obi-Wan on is none other than the Tantive IV, the ship the rebels are in in the opening minutes of the original Star Wars movie, A New Hope. While the interior of the ship in Revenge of the Sith resembles that of the ship we see in A New Hope quite closely, the exterior bears only a basic resemblance. It is not quite clear what exactly happens between the two movies that causes the changes in shape, texture and color by the time A New Hope comes around. 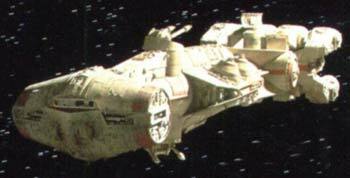 It is only clear that the graphics effects artists seemed to have no interest in doing anything other than trying to construct a new Tantive IV model with a computer using only their memory. If that is what was done, then I'd say they did a pretty good job. 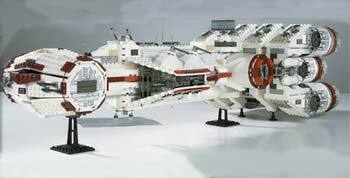 However, for future productions, they may be better served to examine the old models or even pictures of them. Fans are already making excuses for this inconsistency by citing numerous Star Wars geek resources such as the Star Wars: Technical Journal which describe the Tantive IV as being modular in design. That is all well and good, but I am interested in knowing exactly how adding and/or subtracting modules can cause the overall size, shape and proportions of a shipt to change so drastically. Perhaps this will be explained in Star Wars: Technical Journal 2: Explaining the Inane. While flying around with Obi-Wan and Yoda, Bail Organa gets an invitation to a special session of the Senate. After hearing this, Yoda proclaims, "If special session of the Senate there is, easier to get into the temple will it be." What he fails to explain is why exactly this is true. In keeping with the true nature of Star Wars planets (i.e. ice planet, desert planet, cloud planet, forest planet, city planet), we are treated to another planet that has no variety at all: a special volcano planet! This makes me pray for an Episode VII, holding out hope that there will someday be a tornado planet. "The attempt on my life has left me scarred and deformed... but I assure you my resolve has never been stronger." When Palpatine gets before the Senate, he announces that the Republic will be reorganized as the First Galactic Empire. Everyone in the Senate then applauds wildly, as if Palpatine had just opened for Van Halen. Padme, sulking in her Senate seat, says, "So, this is how liberty dies... with thunderous applause." We are then left to reel at that biting political commentary. And by "reel," I of course mean, "cringe." "For the clones to discover the recalibration, a long time it will take." There is a coded message being sent out for all Jedi to return to the Jedi temple. Yoda and Obi-Wan agree that they have to recalibrate the code so that more Jedi do not fall into the trap. This is very handy, because warning the Jedi to stay away leaves the possibility for a much greater number of expanded universe novels, TV shows and video games to feature Jedi survivors doing Jedi things like flipping around, using lightsabers and flipping around some more. After Obi-Wan recalibrates the code, Yoda then says, "For the clones to discover the recalibration, a long time it will take." If Yoda says it, it must be true! Had Yoda not said anything, the scene would have just been simply unmemorable. Choosing to open his big mouth and explain it poorly raises the question: "Why?" Yoda decides that he and Obi-Wan must split up, because any good plan usually begins with splitting up. Yoda will take care of Palpatine, and Obi-Wan will kill Anakin. Obi-Wan disagrees with this plan, because he doesn't think he can kill Anakin, being that they are so close. It is unclear why, seeing that Anakin is so far away, they don't both attack Palpatine together, then go for Anakin together as well. It's especially puzzling since every single battle the Jedi have had with the Sith have been two-on-one affairs: Qui-Gon and Obi-Wan versus Darth Maul, Obi-Wan and Anakin versus Count Dooku, Obi-Wan and Anakin versus Count Dooku again. I worry about the collective wisdom of Obi-Wan and Yoda if they choose now to finally level the playing field and have a fair one-on-one fight. "You and I Can Rule the Galaxy"
It is more than clear that Anakin has flipped his lid when he declares that he can become powerful and overthrow the Chancellor and then he and Padme can rule the galaxy together. He tells her that, when they rule the galaxy, they can make things the way that they want them to be. The true treachery of the Sith is shown in this scene where Anakin is plotting to kill his master after being his apprentice for less than five hours. This is why the believability of the Sith ever having a master/apprentice relationship is difficult to grasp. Anakin's desire to have a "kickass husband-and-wife team" rule the galaxy is also pretty thin. Anakin only stops short of going into specifics: "You've got great fashion sense, so you could design all the different uniforms for our soldiers and I could lead them into battle. Think of how great they'll look when they're eliminating an entire planet for not agreeing with your interior design schemes!" "Only a Sith Deals in Absolutes"
At this time in the movie, Obi-Wan is running out of lines from his Jedi playbook. He's said, "Search your feelings" a few dozen times and, "Let go of your hate" and all the other Jedi classics. By this point, Lucas's commentary on the state of United States politics is already quite tired and transparently adolescent. When he starts lifting lines directly from George W. Bush speeches, it summons cringes from deep within your soul. We know that Lucas intends this movie to be a clever metaphor for what is going on in the United States right now and, more so, where it could be heading. Unfortunately, it is so obvious and poorly done that it fails on every possible level. And that's coming from someone who happens to share Lucas's political views. What's more is that Obi-Wan, up until this point, has been trying everything he can to get Anakin to come back to the light side. After Anakin says, "You are either with me or you are my enemy," Obi-Wan just shrugs, throws his hands up and unclips his lightsaber. Once he sees that Anakin is dealing in absolutes, he utters the words, "Only a Sith deals in absolutes." That's it. There's no more talking necessary. If Anakin said what he said, then he is clearly a Sith and there is no saving him. I know if one of my oldest friends suddenly had a marginal change in their political view I would probably prepare to fight him to the death. Paul: I think U.S. operations in Iraq are a good idea. Nate: Listen to yourself, Paul. You were against the war months ago. Paul: I know, but I've had time to think about it and I think it is in the long-term best interests of the U.S., the Middle East and the Iraqi people. Nate: *sigh* Prepare to die. The lightsaber duel between Obi-Wan and Anakin starts off harmless enough. It's your standard fare of over-the-top theatrics and unnecessary flips, sped up to make the adrenaline pump even harder. There is one moment, however, that jumps out as being a little too much. At one point, the two Jedi stand mere feet apart and begin twirling their lightsabers in a way so idiotic that it not only leaves them both completely vulnerable to any form of attack, but simultaneously offers absolutely no chance of inflicting any damage on the other. I would imagine that it is a move better suited for retired Jedi who have taken their talents to the circus and street shows rather than for actual combat. I like to call it the Cirque du Soleil technique.